Broken Wheel, Iowa, has never seen anyone like Sara, who traveled all the way from Sweden just to meet her book-loving pen pal, Amy. When she arrives, however, she finds Amy's funeral guests just leaving. 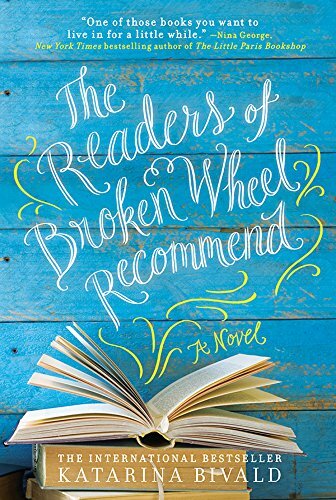 The residents of Broken Wheel are happy to look after their bewildered visitor―there's not much else to do in a dying small town that's almost beyond repair. You certainly wouldn't open a bookstore. And definitely not with the tourist in charge. You'd need a vacant storefront (Main Street is full of them), books (Amy's house is full of them), and...customers. The bookstore might be a little quirky. Then again, so is Sara. But Broken Wheel's own story might be more eccentric and surprising than she thought. A heartwarming reminder of why we are booklovers, this is a sweet, smart story about how books find us, change us, and connect us. 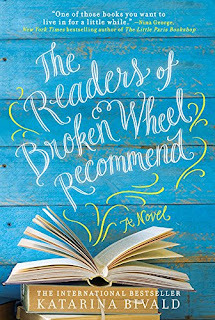 The Readers of Broken Wheel Recommend is a sugary sweet story that was a little too predictable for me. I didn't connect with any of the characters nor was I rooting for them in any way throughout the story.... but it was a cute story. I like the idea of a complete stranger from another country pulling together the small town and helping the residents who were quickly losing hope. I just wish there were a little more twists and turns so I didn't see every plot line coming from a mile away. I especially love all the talk of books and how Sara shares books with the town. I think that's what saved the book from being a total dud for me. Overall it was an enjoyable read, I just feel it had potential to be a much better story. I recommend this one for anyone who loves light and fluffy chic-lit. There are times when I need predictable and I'll try to keep this book in mind for one of those times.